UTICA NY – Utica’s giving community proves it again: In tough times, good people come together to pick each other up. 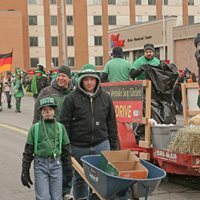 For the 11th straight year, organizers of Utica’s St. Patrick’s Day Parade asked parade-goers and marchers to bring non-perishable food items to the parade, to support Mother Marianne’s West Side Kitchen. And for the 11th straight year, the community responded. Named for Blessed Mother Marianne Cope, who grew up in West Utica and went on to devote the last 30 years of her life to the lepers of Hawaii’s Molokai, the West Side Kitchen provides free meals to the area’s working poor, the unemployed, the homeless, and individuals and families struggling with few resources. Solely dependent on donations and the dedication of caring volunteers, Mother Marianne’s West Side Kitchen has been adopted as a charitable cause by Utica’s St. Patrick’s Day Parade, which has held an annual food drive on their behalf since 2009. On March 16th, Food Drive co-chairs Chris Hoke and Bernie Adorino led their own team of stalwart volunteers up and down the parade route, collecting up food items and cash donations to support the cause. When the dust finally settled, the tally proved that Utica once again had lived up to its unofficial moniker, The City With a Heart, as 1111 food items were collected and turned over to the West Side Kitchen, along with cash donations totaling $1750. To learn more about Mother Marianne’s West Side Kitchen, including how you can continue to support their mission, visit http://www.westsidekitchen.org/.